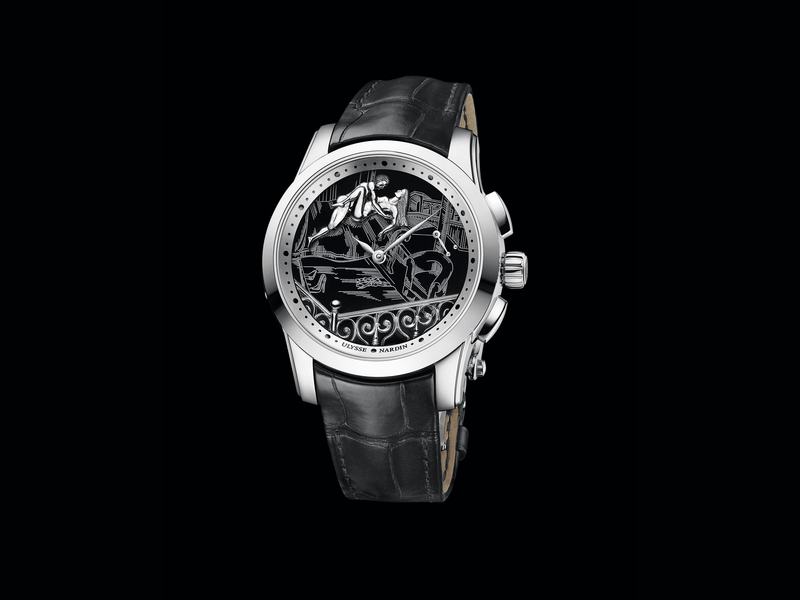 This year’s SIHH suggested that, even more so than last year, 2014 will be the year of women’s watches with brands from Ralph Lauren to Richard Mille via Parmigiani and Audemars all presenting new pieces made exclusively for the female market. And, if Baselworld previews and leaked novelties are anything to go by, then the world’s biggest watch fair is set to follow in the footsteps of its Geneva counterpart. One of the most appealing pieces to be shown so far comes from Hublot in the form of the Big Bang Pop Art, which delivers exactly what its name suggests! Andy Warhol may have had more conservative tastes when it came to his own watch collection – being a renowned lover of the Cartier Tank, among others – but there is no doubting the main influence for these psychedelic new timepieces, and through them the genius of Warhol and the Factory lives on. The perfect genre for Hublot to align itself with, Pop Art challenged the traditional thinking of fine art by bringing in images from popular culture. 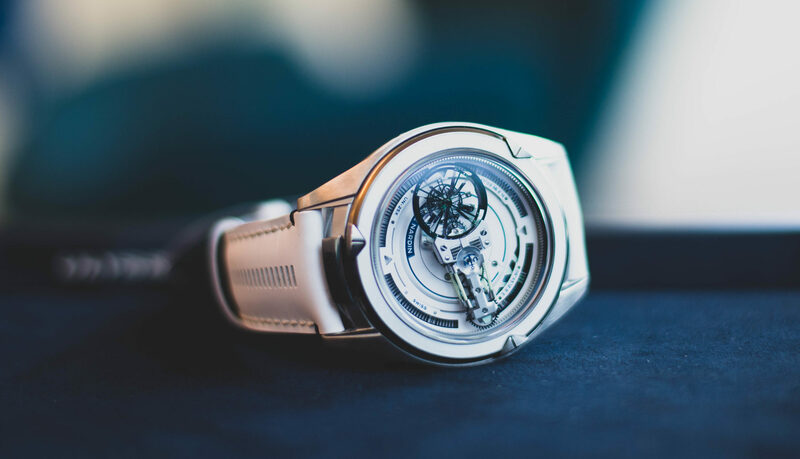 In a similar way Hublot – and especially the Big Bang – can be said to challenge perceptions of fine watchmaking, pushing the boundaries of traditionally acceptable design and materials. 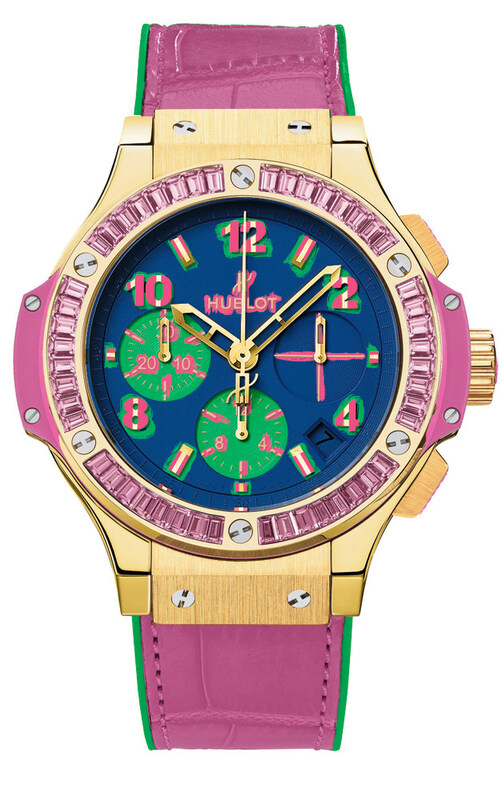 Just as Pop Art divided opinions in the art world, Hublot has managed to alienate the establishment while at the same time establishing a legion of fans and supporters the world over. Simple, joyfull, bright and atmospheric, this 41mm Big Bang evokes the spirit of the Pop Art movement without imitating or duplicating it. A colour palette of shocking pink, neon blue, hazy purple and acid green has been used to create the four-piece collection. 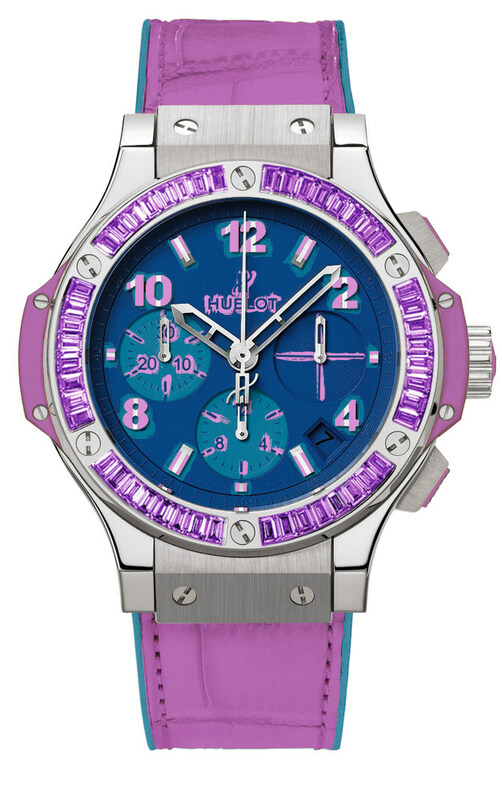 Subdials at 6 and 9 o’clock are in clashing hues, while the expected Hublot bling is added through the bezels that feature 48 baguette-cut precious stones: topaz, amethyst, sapphire or tsavorites. 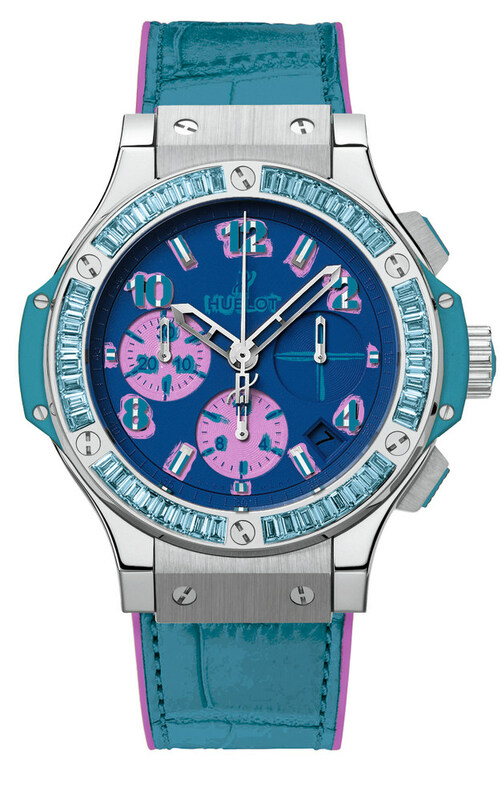 The Pop Art theme continues through the super-bright alligator straps, which are backed by contrasting rubber. Powered by the HUB 4300 self-winding chronograph movement, the watch has a power reserve of 42 hours and is water-resistant to 100m. With two colour combinations available in steel (blue and purple) and two in yellow gold (pink and green), each model is limited to 200 pieces.